Gold Bullion is the precious metal gold in bulk form. It is available in the form of ingots (bars) or coins. Both forms are available in varying sizes to fit the investor's and collector's needs. 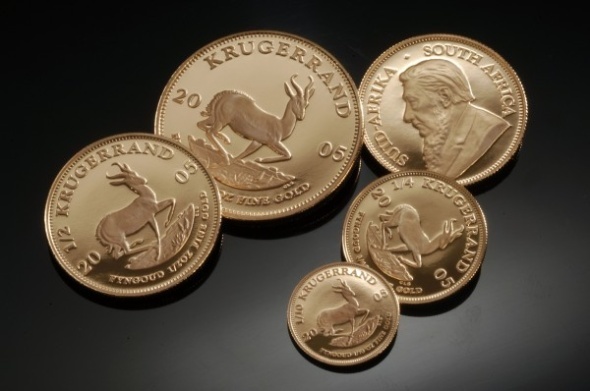 A bullion coin differs from other collectible coins in that it is valued by its size and purity rather than its age, condition, rarity and mintages. Coins or currency which must be accepted in payment of debt of the country of issuance and may be marked with a monetary value on the coin, however they are not actually intended to be used in commerce. They are actually collected for their intrinsic valueIn numismatics, intrinsic value is the value of the metal the coin is made of, in many cases a precious metal such as gold or silver. The value of the coin as defined by law, eg a nickel has a face value of 0.05 dollars. The price that people are willing to pay for the coin in the market place. which depends on the current market value of gold. Gold is a very soft metal making it easily scratched and prone to wear quickly. Other metals are often added to the gold to make it harder and more wear and scratch resistant. So, the Candian Gold Maple Leafs made of 24 karat gold would be very soft whereas the United States Gold Eagles made of 22 karat gold would be less easily damaged due to handling. Now consider a one troy ounce coin of each - They would both contain a full troy ounce of gold, however the United States Gold Eagle would just be a slightly larger and heavier coin due to the other metals present in the coin. Gold Bullion Coins are usually minted in several weights, including 1 oz., 1/2 oz., 1/4 oz., 1/10 oz. and 1/20 oz., ranging in actual physical size from about the size of the United States Half Dollar to about the size of the United States Dime. The fineness, or purity of the gold varies from country to country. For example, Candian Gold Maple Leafs are .9999 pure or 24 karat gold, while United States Gold Eagles are .9167 pure or 22 karat gold. Even though gold bullion coins are bought and traded for their intrinsic value, they are still beautiful pieces of art. With the many different designs available, they can make a wonderful collection for the collector who has the money to invest in them. For some great deals on Coins and Coin Supplies visit my friends at Jake's Marketplace, Inc. They have a very comprehensive selection to choose from and give great discounts!